Parents and young athletes may have wrestled with the decision whether to play contact sports, as research shows the injuries that players can suffer from blows to the head. But lesser known parties to the games may be the undoing of professional and organized soccer, hockey, and football: Insurance companies. The firms, which provide necessary and invaluable protections to players and organizations by spreading the financial risks of harms, have fled professional and amateur sports, declining to offer them coverages, even at high costs, Steve Fainaru and Mark Fainaru-Wada of ESPN’s Outside the Lines program reported. 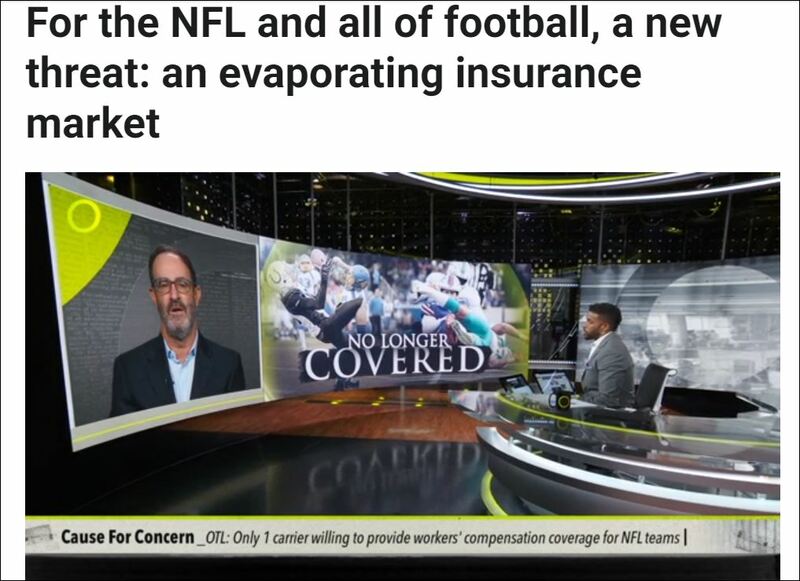 Insurers are balking not only at providing liability policies but also worker compensation for pros, ESPN says. The dearth of coverage has hit hard the NFL, collegiate and Pop Warner programs, as well as football helmet makers. They’re forced to hunt far and wide for the few firms willing to assume sports risks — and they pay high and accordingly, if they can get policies. Insurance companies, which earn billions of dollars each year by taking on risk, are increasingly reluctant to bet on football and other sports associated with traumatic brain injuries. Some insurance industry executives compare the issue to asbestos, an occupational hazard that has cost insurers at least $100 billion. Traumatic brain injury ‘is an emerging latent exposure the likes of which the insurance industry has not seen in decades,’ Joe Cellura, president of North American casualty at Allied World, wrote in a blog post last year for the website Risk & Insurance. Because the harms of head hits can take decades before athletes display damage, insurers and customers fear long-running and widespread legal challenges, implicating not just pro leagues but also colleges, universities, high schools, and kid programs. In Maricopa County, Ariz., the community college district abandoned a successful, championship-winning football program after officials scrutinized its costs. They found that, in a district of 20,000 students, 358 football players accounted for a third of all insurance costs. They could not justify this expense. Pop Warner, which has settled several lawsuits over its players’ head injuries, had to scour for coverage and is paying dearly for it, ESPN reported, noting that football helmet makers told the network only one company will cover their product in liability cases. The NFL works with just one firm and declined to discuss the spare market for insurance. College football faces an increasing number of head injury claims. To understand why requires some basic information about the $1.2 trillion insurance industry. Insurance customers, of course, are buying peace of mind: the knowledge that their financial needs will be met if a costly event takes place. Companies profit by betting that they will take in more in premiums and investment income than they pay out in claims. To price that risk, the carriers — much like casinos and sports books — calculate the odds that a loss will occur, mining mountains of data about everything from traffic accidents to mortality rates. Auto and life insurance are the craps tables and roulette wheels of the industry: The data set is so large that companies have a high probability of making money. What scares the industry about football is the limited available data and the vast uncertainty. There are roughly 300,000 football-related concussions each year… But the prevalence of CTE, and the likelihood that current players will develop dementia or other disorders, is unknown. The ‘trigger’ — how and when the disease starts — has not been established. CTE can be diagnosed only after death, and the symptoms, which range from depression to delusional behavior, might not surface for decades. In my practice, I see not only the harms that patients suffer while seeking medical services, but also the damage that can be inflicted on them by brain and spinal cord injuries, notably through concussion and other head hits in sports, especially if helmets and protective gear are defective and dangerous products. Let’s be clear here: Insurers act in their own self-interests and those of their share-holders. Their foremost concern in fleeing sports coverage isn’t athletes’ well-being but their own treasuries. And let’s also not blame lawyers and lawsuits for insurers actions, because the law can help improve games and player safety. That could be a tough choice for those who love soccer, hockey, and football — much less the many other sports in which head harms are a risk. But players, parents, and coaches may wish to take heed that insurers are conservative and profit-focused: The firms strive to be smart money, and they don’t see games in which players get hit in the head as anything close to a reasonable bet for now.